Almost everybody who is outside sometimes looks at the clouds. Recognizing them or not will be a question of attitude he or she has got right to nature. Predominantly, the collection called "Cloud Gallery" is supposed to give support to the lecture series "Cloud Physics and Chemistry" which meteorology students can take at the department of Physics at the Johannes Gutenberg University in Mainz. It is not directly designed for publicity or commercial purpose, but everyone is welcome to have a look at it. The "Cloud Gallery" is an ongoing project that will be corrected and re-organized time by time. The last update was published in December 2005. Within the studies of meteorology lectures are often theoretically orientated, that means lecturers often emphasize the strictly mathematical description of physical phenomenons. For example the theory of the homogenous or heterogenous nucleation regarding to cloud droplet formation or the "theorectial meteorology" as a whole topic. After some terms the students might loose the feeling for nature itself. Therefore the aim of these pictures is to make a connection between the abstract description of the atmospheric processes and the real observations. This connection might be often some kind of comparison, because abstract constructions made in theory are rarely found in real nature in its pure manner. Therefore some of the nomenclatures in the "Cloud Gallery" seem to be somehow cryptic. Most of them are conform to the official nomenclature of the WMO, but not all. Some of the entries of the "Cloud Gallery" also tell the story of a long enduring event or one that shows an eye-catching development in time. Examples are "Jetstream Cirrus Clouds", "Cold Frontiers" and "Tropical Rain". By this means the observations are tried to be embedded into an atmospheric context which demands to show more than a single picture. 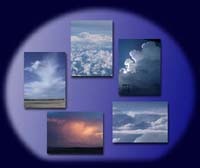 Hence all pages of the "Cloud Gallery" contain short or also more detailed descriptions of the images. I have tried to write the comments in an intelligible way to all readers, but sometimes more technical terms have to be used. A further aim of this picture gallery is to motivate the observer himself to have a closer look to the sky and to take more often images. Therefore most of the images presented here do not have such a high quality compared other publications in the World Wide Web or in other print media. These are typical results one can achieve observing an atmospheric phenomenon by accident and using a camera that is not necessarily appropriate for such a purpose. (Not until 2004 pictures for the "Cloud Gallery" were taken with a digital SLR camera). After only a short time of regular "Sky Watching" the observer being on the ground or on a journey in an airplane will be astonished, how manifold the phenomenons are and how much we can recognize and learn about atmospheric processes just because of having a look at them. In the history of painting many artists have illustrated clouds in their pictures and thereby consciously or not reproduced different cloud types. Some examples are added to the entries of the " Cloud Gallery" and shortly commented. For sure, these comments are subjective and speculative and shall provoke to own notions and once again to a closer look. A large amount of images originate from field campaigns taken by graduate and PhD students, members of our research group or friends of mine. I am especially delighted that more and more students show me their own pictures asking if the material might be suitable for the "Cloud Gallery". Personal thanks to everyone who made a contribution. For sure, the owner of the image still holds the copyright. Therefore the source of each of it is listed in the "Cloud Gallery". The same is true for "external images", for example pictures taken from satellites or the Space Shuttle published by NASA. Since the "Cloud Gallery" was published in the World Wide Web in the summer of 2004, I got a number of enquiries about releasing pictures, mainly from journals or colleges. On demand I will send TIF or JPG files with high resolution to the interested party. However, this is only possible without any problems for my own pictures. In other cases I have to ask the owner for permission to release them. Here it might be beyond my power to get the licence, but happily there has never been such a case. The original "Cloud Gallery" was translated into the English version by Nicole Drewnick who also performed the actual design and layout.